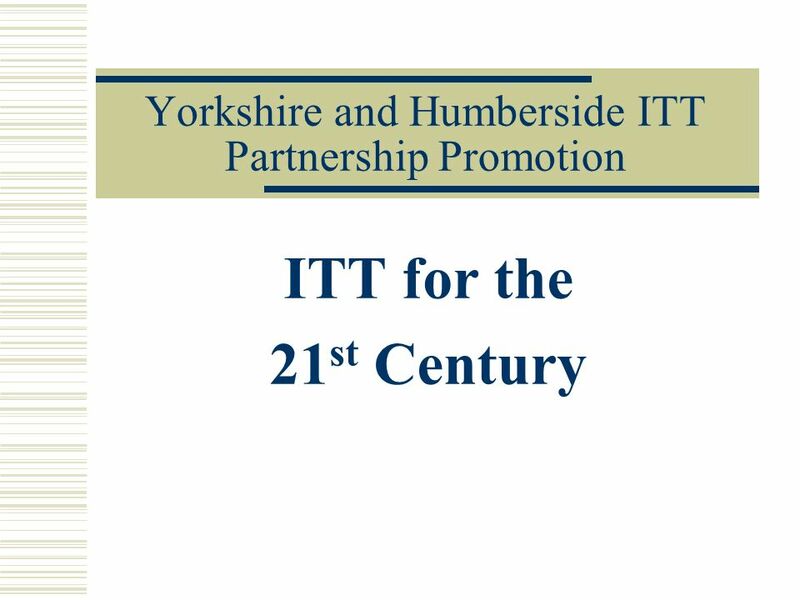 Yorkshire and Humberside ITT Partnership Promotion ITT for the 21 st Century. 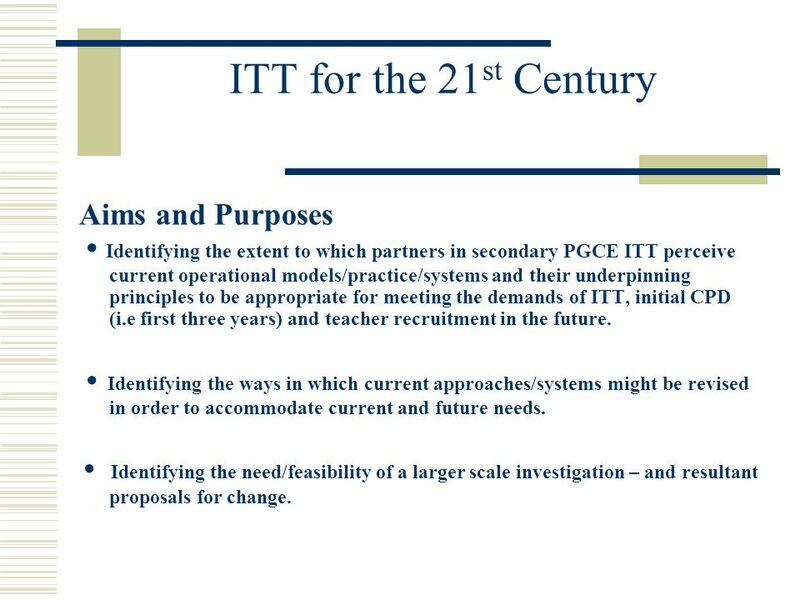 3 ITT for the 21 st Century Aims and Purposes Identifying the extent to which partners in secondary PGCE ITT perceive current operational models/practice/systems and their underpinning principles to be appropriate for meeting the demands of ITT, initial CPD (i.e first three years) and teacher recruitment in the future. Identifying the ways in which current approaches/systems might be revised in order to accommodate current and future needs. Identifying the need/feasibility of a larger scale investigation – and resultant proposals for change. 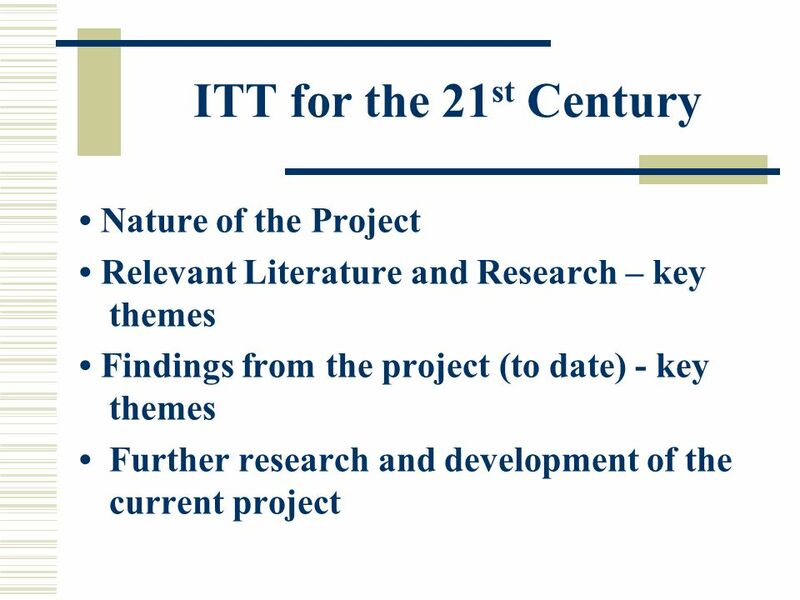 Download ppt "Yorkshire and Humberside ITT Partnership Promotion ITT for the 21 st Century." George Shovlin St. Aidans R.C. School Boys Comprehensive Sunderland. 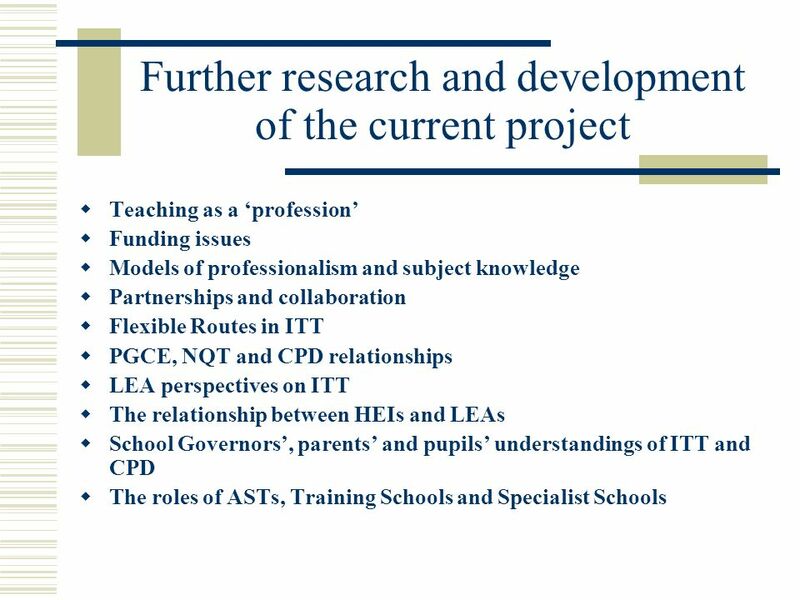 TTA NATIONAL PARTNERSHIP PROJECT PHASE ll Yorkshire and Humber Regional Steering Group ITT Capacity in Rural and Distant Areas. Yorkshire Museums, Libraries & Archives Council Contexts other than schools Initial Teacher Trainee Placements in Museums, Libraries and Archives Jael. Training for Progression ITT Effective Practice Conference TTA Partnership Project Yorkshire and Humberside June 23 rd 2003. The National Healthy School Standard Ruth Heatherley National Adviser, Schools and Young Peoples Health. 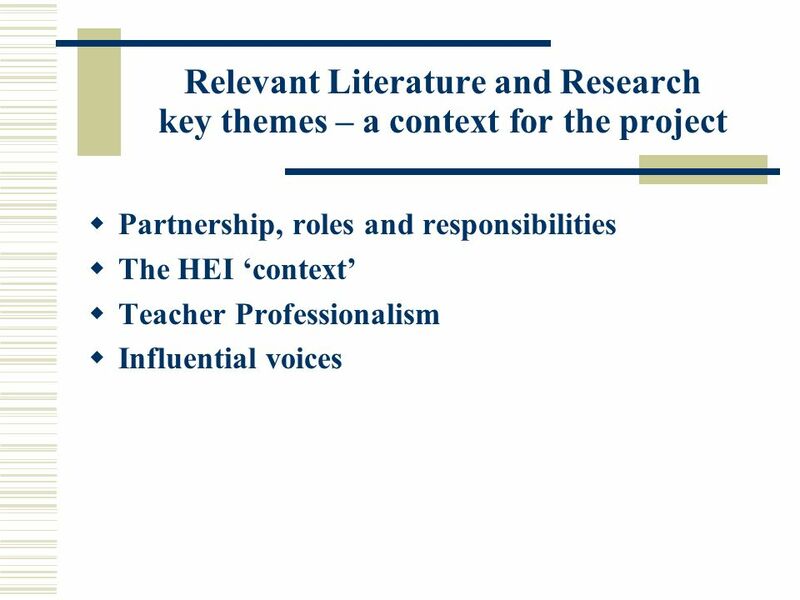 Oxford Centre for Staff and Learning Development Research study: initial positioning paper Rhona Sharpe. Widening Participation in Education Through Workforce Development Lesley J. Moore. Churchill Fellow and National Teaching Fellow 2005 University of the. Connecting it up: towards a Route Map for STEM education A project managed & researched by Dr Elsa Ekevall. Perspectives on Learning Seminar Myra A Pearson Head of School of Education 18 March 2008. 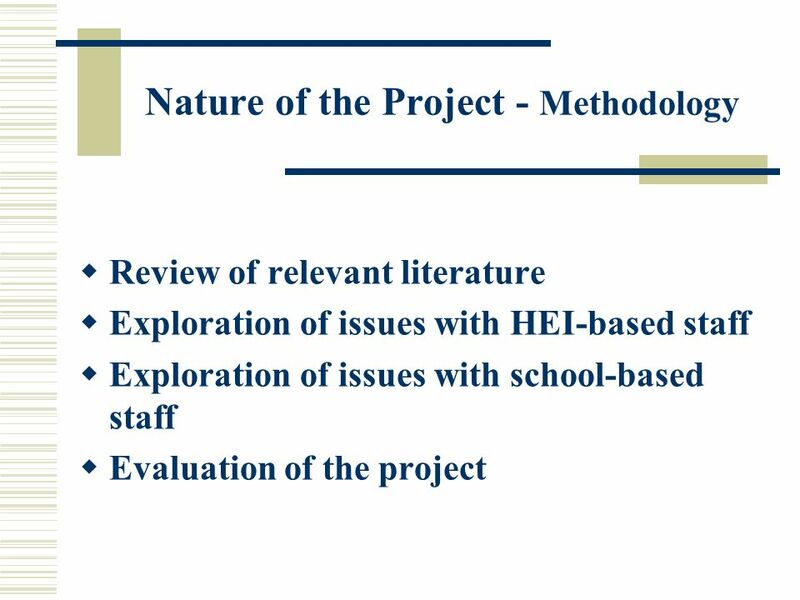 The Professional Development Needs of Teacher Educators in Higher Education Institutions (HEIs) and School-based Mentors in Schools Researcher: Becca Westrup. The pastreview caring school standardfuture core features rolesdownload ©Terry Ashton Guidance in schools – a future? Terry Ashton Adviser (Guidance and. All Through Schools for 3 – 19 year olds. School Modernisation Programme Two major reviews: Primary Modernisation on an Area Basis Secondary/Post-16 Modernisation. The Park Community School Barnstaple Produced as part of the Partnership Development Schools (PDS) Strategy Phase (Lead PDS: The Park Community. The New National Curriculum Expert Subject Advisory Groups. A Framework for collaborative relationships Summary and reflections from the 15th February discussions. Strategies for Effective Employer Engagement Lessons from the South West Higher Level Skills Pathfinder Project. Developing people, improving young lives Your child, your schools, our future: building a 21st century schools system Diocese of Blackburn: succession. The Park Community School Barnstaple Produced as part of the Partnership Development Schools (PDS) Strategy Phase 3 2008-09 (Lead PDS: The Park Community.